Conspiracies abound and opinions vary, but some seem to think the denunciation was a bad call. Earlier this week, Kyrgyzstan denounced a cooperation treaty with the United States in fury over the U.S. State Department’s choice of Azimjan Askarov as a recipient for the 2014 Human Rights Defender Award. While I covered the details of the treaty that is being denounced in a previous post, 24.kg, an independent Kyrgyz news site, recently asked several Kyrgyz experts for their views on the diplomatic row. Their responses provide a glimpse into the domestic reaction to – and perhaps the politics surrounding – the Kyrgyz decision to junk a treaty almost as old as the state itself. 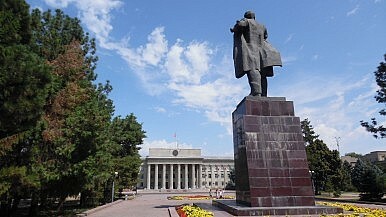 Sydykova, it should be noted, was Ambassador under Kyrgyzstan’s previous president–Kurmanbek Bakiyev–who was ousted in the 2010 Kyrgyz revolution. He’d come into power after the first, in 2005. His ouster was seen by many as a victory for Russia. In 2009 he promised to close the U.S. airbase at Manas, accepted Russian aid, and then renegotiated the Manas lease with the United States anyway. In fact, we rejected the assistance provided by people of the United States at no cost. This move doesn’t grace the country in the global space. We have nothing special to boast of, but now we show ourselves as wild, ignorant and narrow-minded people. The government of Temir Sariev put all the Kyrgyz people in a very ugly situation. The interviewees have a range of opinions on the award and the reaction of the Kyrgyz government. Some, like Sydykova, seem to implicate Russia, while others push back at the United States. A few swerve into conspiracy theories popular across Central Asia, but particularly in Kyrgyzstan, that the United States is deliberately undermining the governments there. Many global political solutions are also taken under their [the United States’] orders. Using its influence on NATO and the European Union, the United States can easily enter any sanctions against our country, to destabilize the situation on the eve of parliamentary elections or joining the Eurasian Economic Union. Scenario in this perspective is extremely undesirable for us. But one look at the list of press releases from the Embassy calls into question where that engagement will be. Many of the releases deal with USAID programs now in question. Nurbek Toktakunov, identified as a lawyer, had perhaps the most philosophical response: “Well, the Kyrgyz story continues, if there is a life – there is hope.” He then questions the legitimacy of the government’s decision to scrap a treaty that was “a matter of national significance, and, therefore, required public debate”–a troubling line of questions in a country with two popular revolutions in the past decade. Why Did Kyrgyz Stage a Protest Outside the Chinese Embassy?The Bishkek Power Plant Saga: Former Kyrgyz Prime Minister Faces Corruption ChargesKyrgyzstan: Power, Prime Ministers, and Power PlantsKyrgyz President Wants to Talk to Trump About RFE/RLWho Are Central Asia's Exiles?